"The Battle of Chile" to "Nostalgia for the Light"
From THE BATTLE OF CHILE, filmed in black and white, on 16mm film, in the midst of social upheaval and revolution, to NOSTALGIA FOR THE LIGHT, filmed with modern digital technology, filled with vibrant colors, poetic connections and introspection, Patricio Guzman's epic body of work is the unprecedented record of one country's journey and one filmmaker's evolution. Born in Santiago de Chile in 1941, Guzman is one of the leading documentary filmmakers in the world. He studied filmmaking at the Film Institute at the Catholic University of Chile, and at the Official School of Film in Madrid. After the 1973 Chilean coup Guzman left the country and has lived in Cuba, Spain and France, where he currently resides. Six of his films have premiered at the Cannes Film Festival, including THE BATTLE OF CHILE, THE PINOCHET CASE, SALVADOR ALLENDE, and NOSTALGIA FOR THE LIGHT, for which he received the Grand Award from the European Film Academy in 2011. 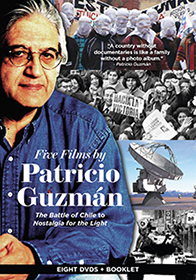 Guzman's THE BATTLE OF CHILE remains one of the most widely praised documentary films of all time, and was named "one of the 10 best political documentary films in the world" by Cineaste. His films have been extensively screened worldwide and he's been the subject of numerous film retrospectives, most recently at the British Film Institute, Harvard Film Archive, and BAMcinematek. In 2013, he was invited to join the Academy of Motion Pictures Arts and Sciences. Exclusive feature-length film about Guzman, FILMING OBSTINATELY, MEETING PATRICIO GUZMAN (2014) by Boris Nicot, an intimate journey of the filmmaker's work in the shadow of the tumultuous history of Chile. THE BATTLE OF CHILE: PART ONE (1975), PART TWO (1976) and PART THREE (1978), the epic and universally acclaimed chronicle of Chile's open and peaceful socialist revolution, and of the violent counter-revolution against it in 1973. Patricio Guzmán (The Battle of Chile) tells Allende's story, from his youth in Valparaiso and his early career, to his presidency of Chile and death during the coup of September 11, 1973.